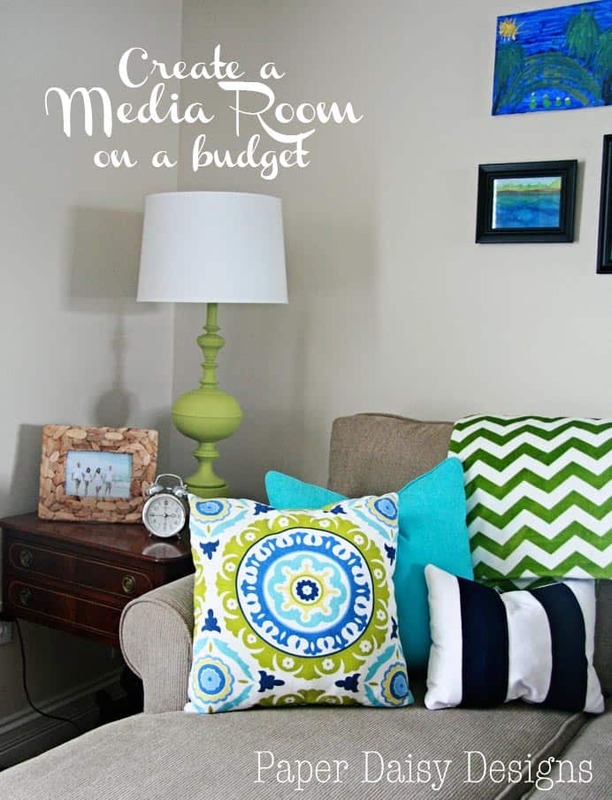 Today I’m so happy to share a complete look into our Media Room. This room previously was used only by our growing teens as a “playroom”. 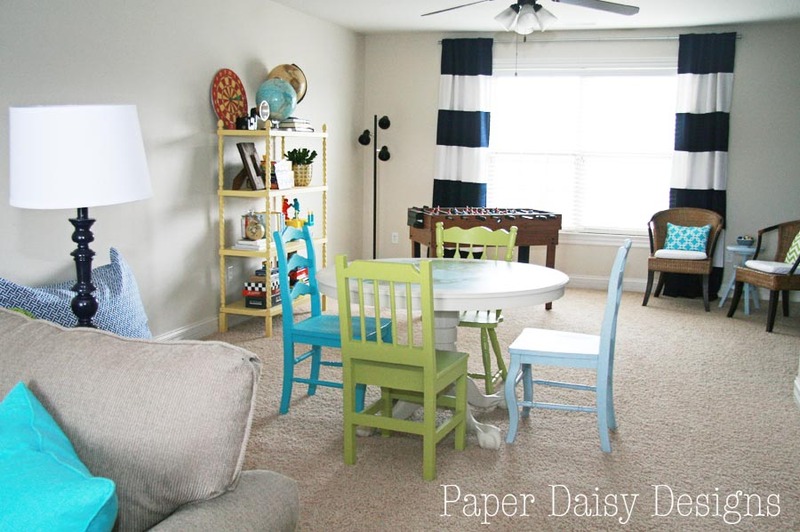 And even though this transformation happened a few months ago, I still slip up occasionally and call it the “play room.” That’s okay we still kind of play in here. Each of the tutorials for my bargain DIY projects found in the room are linked. Enjoy the tour! This is the main area with enough room for the four of us and occasionally the dog sit and watch our favorite TV shows and movies. And yes, the dog definitely watches TV. Opposite the sectional is the media console I created from an old scary dresser, topped with antique movie reels I found at an antique mall about year ago. 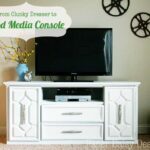 See the total transformation from clunky dresser to media console. I knew from the beginning, I wanted striped curtains. I achieved them in quite a different way than most I’ve seen recently. 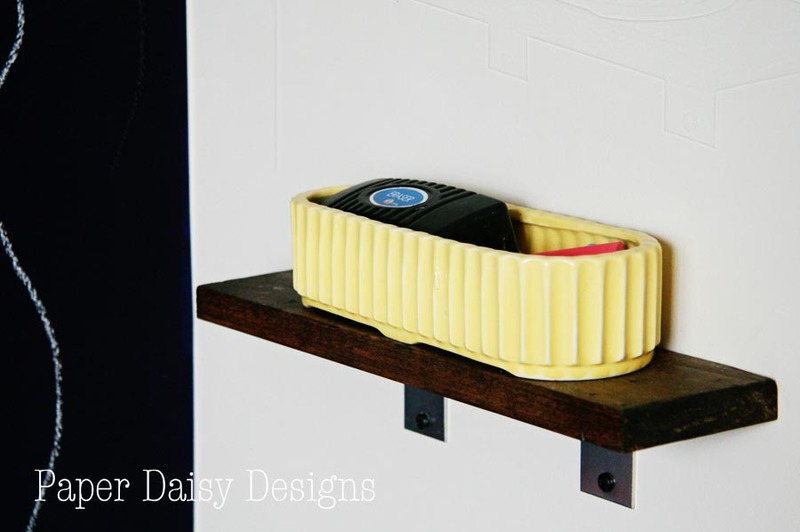 It was a very inexpensive DIY and I think the results were worth the effort. Behind the sectional, as kind of a visual divider between the two areas of the long room, I wanted a sofa table. When I couldn’t find one, I enlisted my hubby to help me build this one. 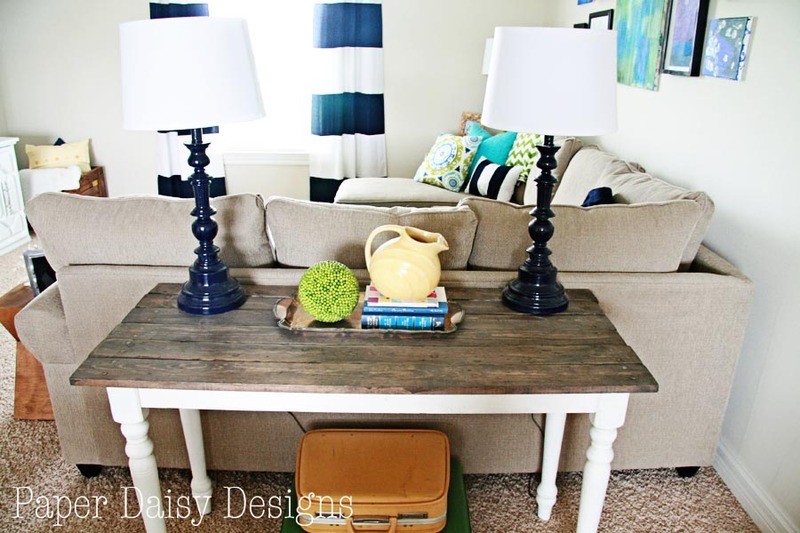 See how we built this table with new wood and old legs. Because the room is very long and kind of narrow, the other side of the room is designated for fun and games. One of the other elements I knew I wanted from the very beginning stages of the room design, was a round table with a map on top and colorful mismatched chairs. A lot of thrifting, scouring Craig’s List, some patience and a little luck is all it took. 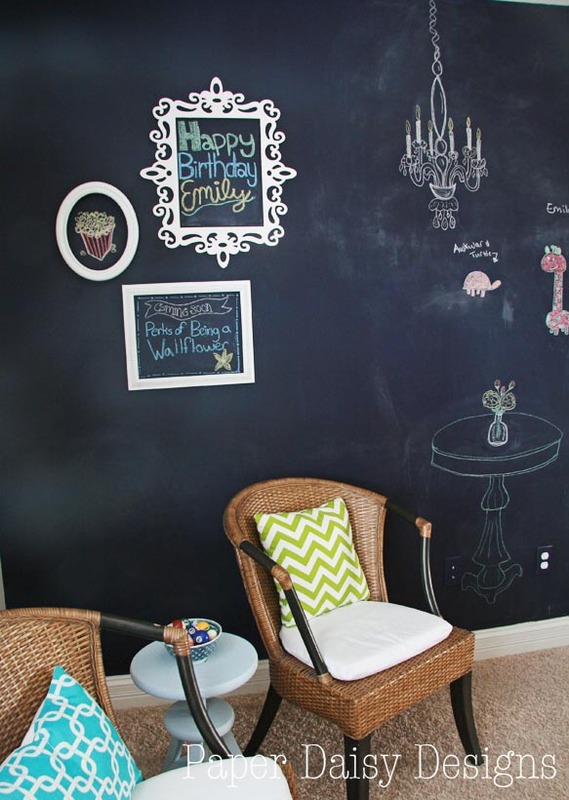 The other item on my checklist of must have’s for the room was a navy chalkboard wall (tutorial link). I didn’t realize the amount schmoozing I was going to have to do to get the right color navy, but it was worth it. The way the closet it situated on the wall next to this area, the chalkboard wall is hidden from view until you come fully into the room. I love that element of surprise! This corner provided a good spot for a conversation area. 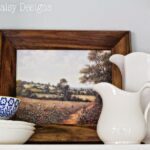 The frames on the chalkboard wall finish this vignette. We debated on adding a chair rail as a chalk ledge, but decided against it in favor of a little shelf and this antique piece of pottery I picked up for a few dollars at an antique mall. This is on the little wall that sticks out because of the closet. 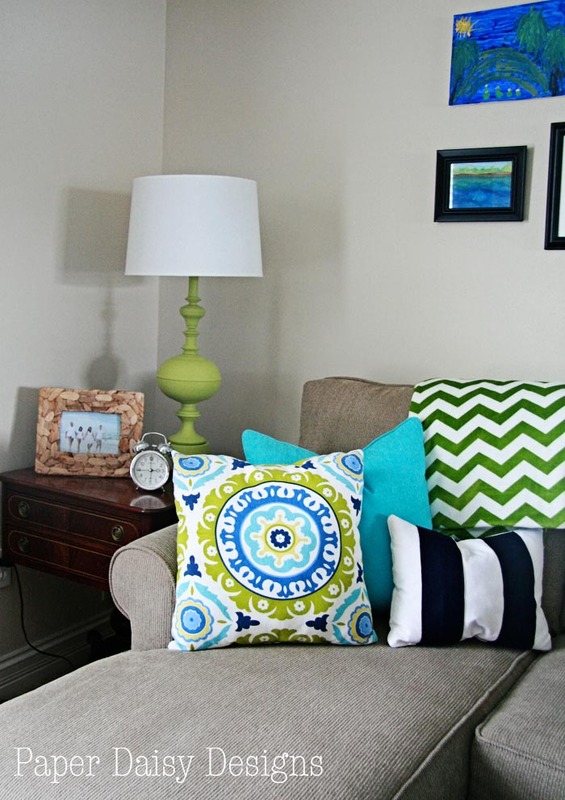 The center pillow was the fabric I found with all the colors in my original color palette. It also included a pretty yellow, which I decided to add to the room. You can see the inspiration board here. Here are a few close ups of other projects in the room. Believe it or not, this little table is the only piece of furniture, other than the small fuse ball/game table, that survived the re-design. 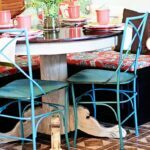 It is sturdy and it fit perfectly in the center of the sectional, so it was meant to stay, but not without it’s own major makeover. See how here. 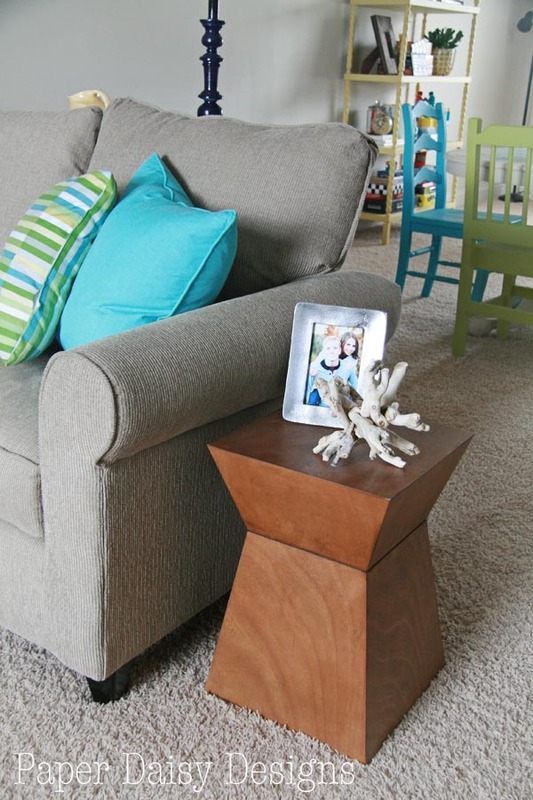 This super cute side table, previously from Target, was picked up for $8 at Goodwill. Did you know your local Goodwill sometimes receives new items that might be only slightly damaged from Target? This was definitely the case with this table. Can you say “lucky score”? There is some damage to the top corner that I was going to fix by either gluing the piece in place and re-staining or painting a color, but honestly it’s hardly noticeable. I might eventually do something else to it. Who knows? 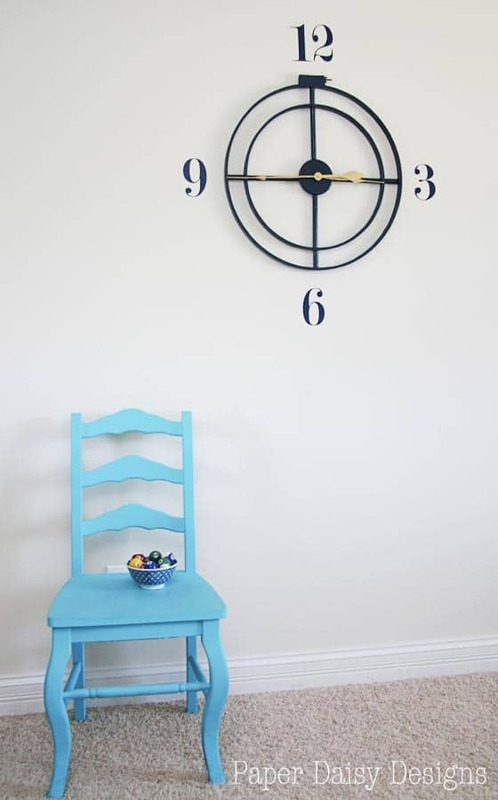 To fill the space between the two sides of the room I made this extra large wall clock. You can see how to make your own here. As far as storage, the room is blessed with a very nice sized closet opposite the table, so the vintage shelving unit provided a space for “pretty storage” and decor. I hunted for quite a while for the right shelving unit. 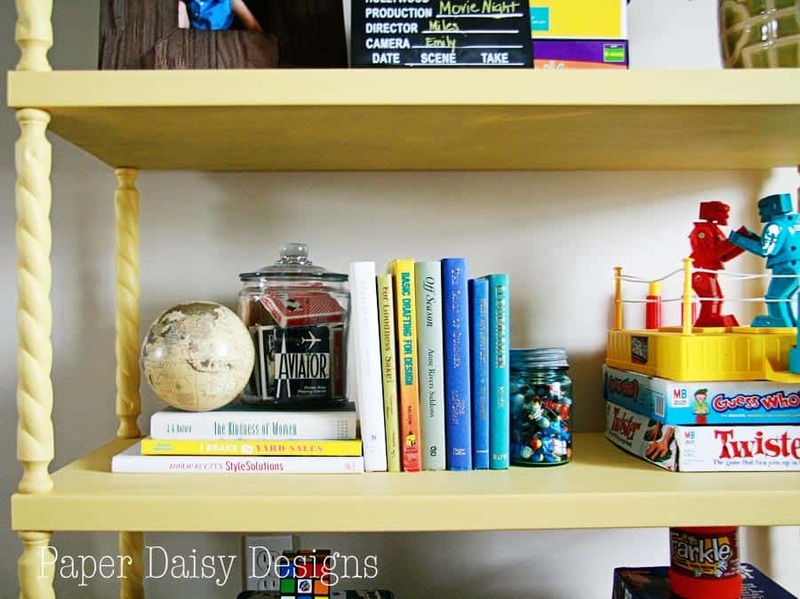 I found that shelving is one item that can be pricey at thrift shops and on Craig’s List. After a bit of hunting I found this one on Craig’s List, of course it got a coat of paint. That’s the great thing about collecting a room on a budget, if you had the money to just go out and buy something, the room would be totally different, dare I say, off the shelf and boring. I met the lady in a parking lot and she handed me some boards and a box of dowels. Ugh!! It was a doozy to put together, not going to lie. While it isn’t what I initially had in mind, I think it’s so fun and whimsical. But on the shelves, my happy heart just swoons over my new collection of globes. Both these were under $15. And on this shelf is one of my most favorite little things in the room. The thing that means the most to me. 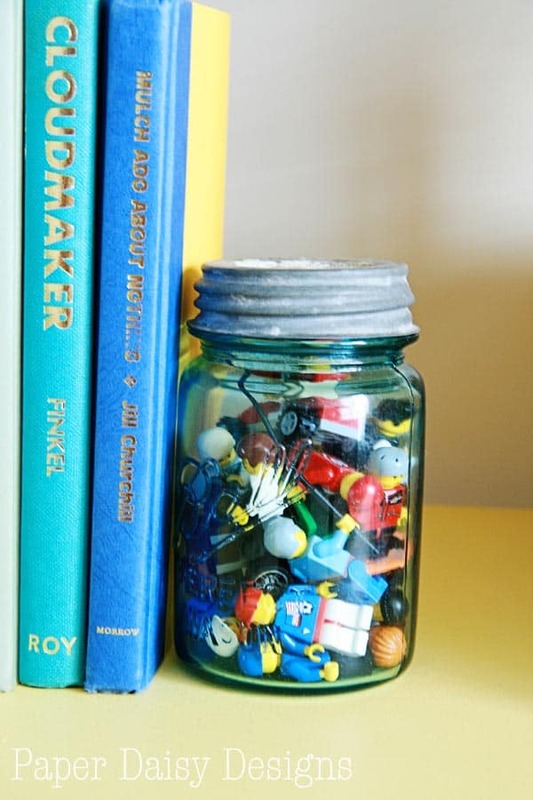 While most kids who visit the room are drawn to the retro Rock ‘Em Sock ‘Em Robots and can’t wait to challenge someone to play, the thing that means the most to me in the room is held inside that antique blue jar being used as a bookend. Those are just some of the Lego people who lived for many years on this side of the room. They had their own village constructed by the little hands, that are no longer little, that used to play in here. for hours on end. Each little Lego person represents a character they created who had a house, a family, a job and a life in that amazing village that our kids built. I think I need a tissue. 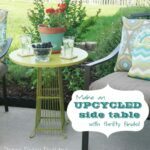 I’ll be back with mini-tutorials of all the DIY projects found here. Be sure to become a follower, either through Blogger or Facebook, so you don’t miss a thing! 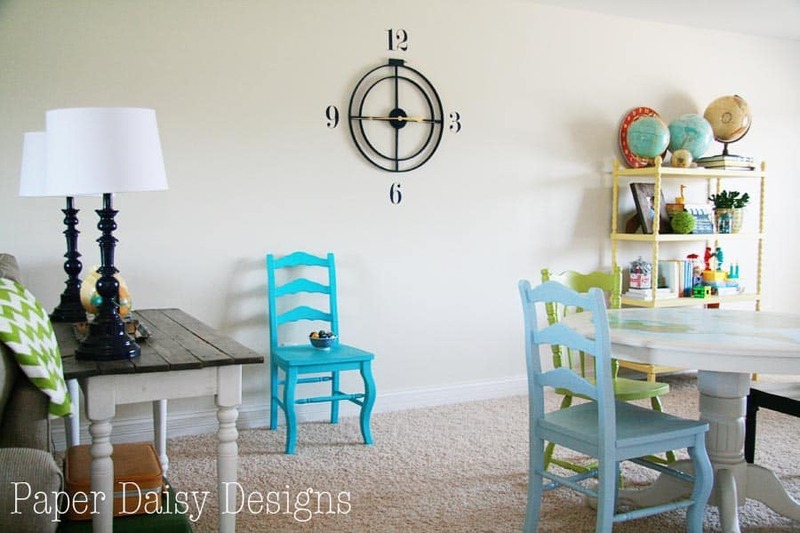 If you want to see the before photos and how I designed the room check out this previous post. I hope you can see that budget makeover is truly possible. 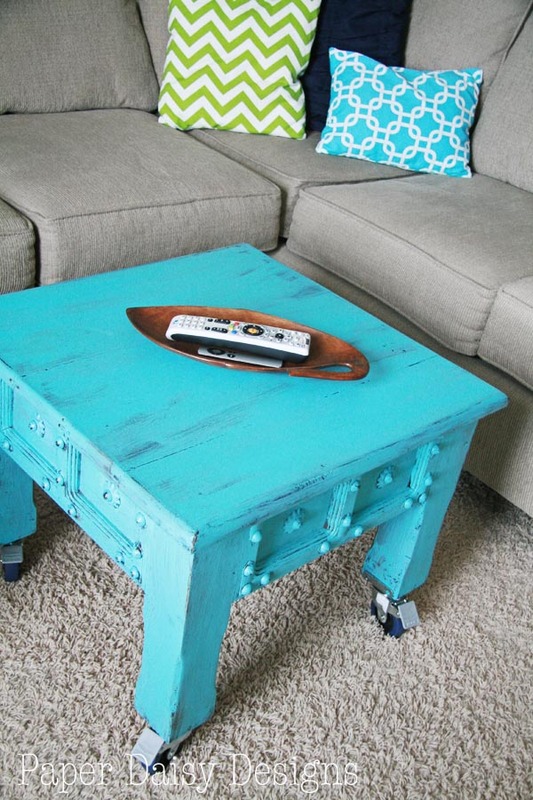 You just need shop smartly at thrift stores, garage sales and Craig’s List and apply your DIY skills. Thanks for taking the tour! If you have any questions, feel free to leave a comment. 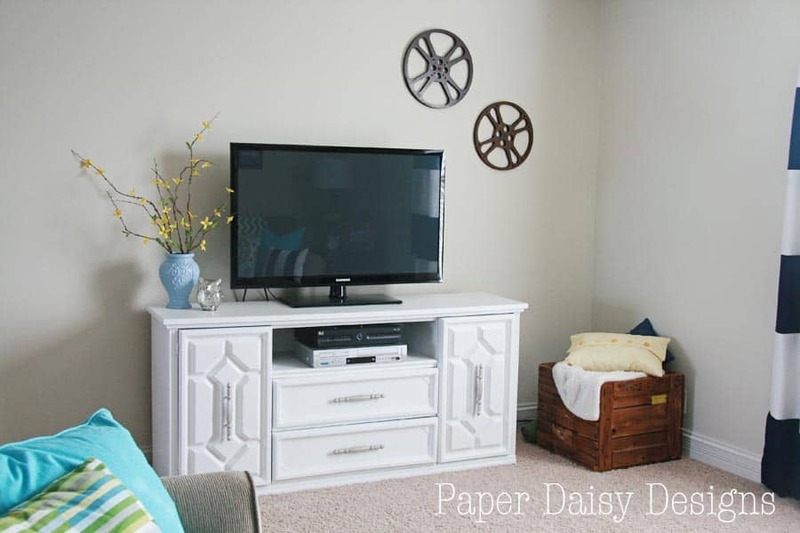 Thank you for subscribing to Paper Daisy Designs. Please continue reading on the blog. I appreciate having you as a reader. Your room looks great! 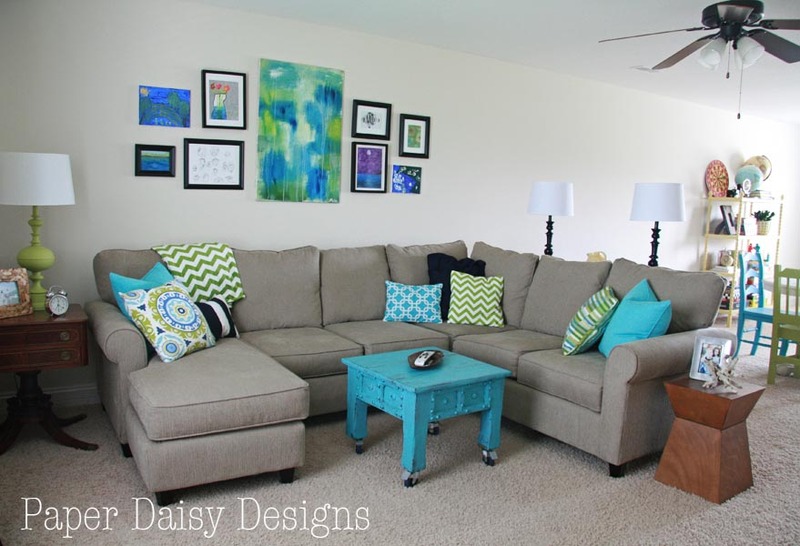 Love the comfy sectional (and that you bartered painting for it -very cool!) Great colours (my favourites) and the striped curtains look lovely. 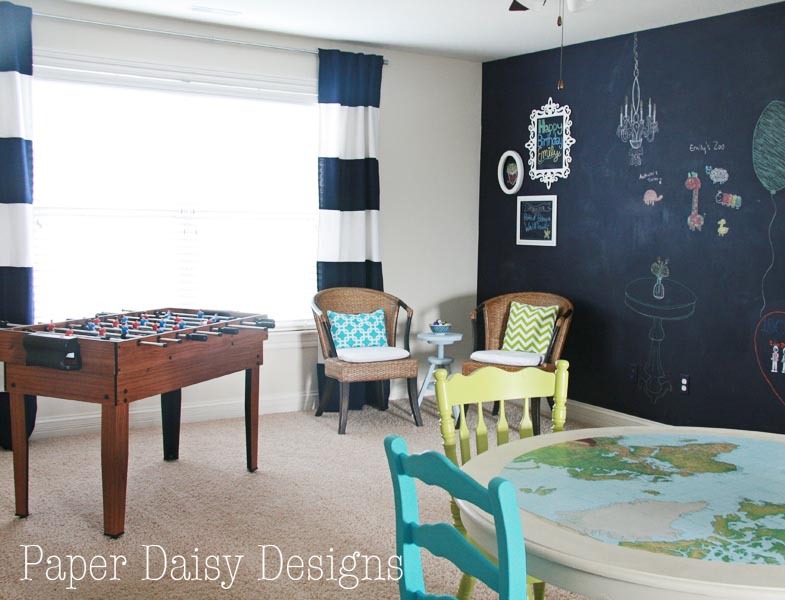 I LOVE the chalkboard wall and the blue table. Wow, what a great room! I love every single detail. 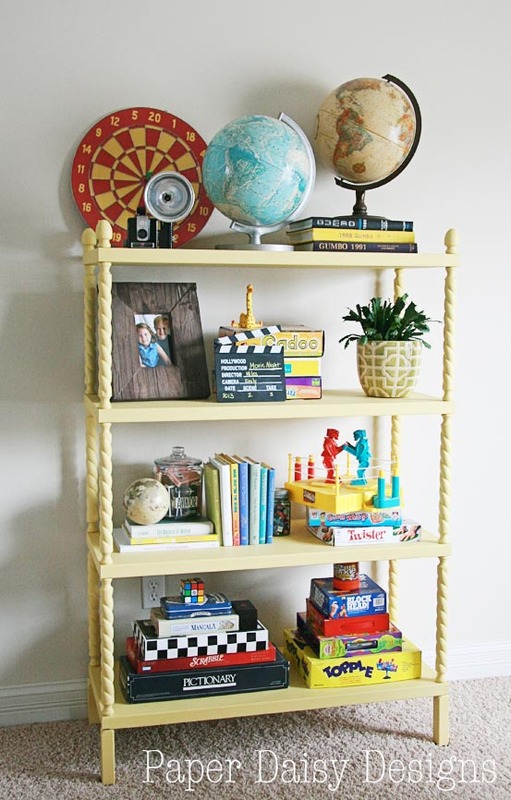 Your yellow bookcase with the globes is my favorite. Great project. I love the greens and blues. 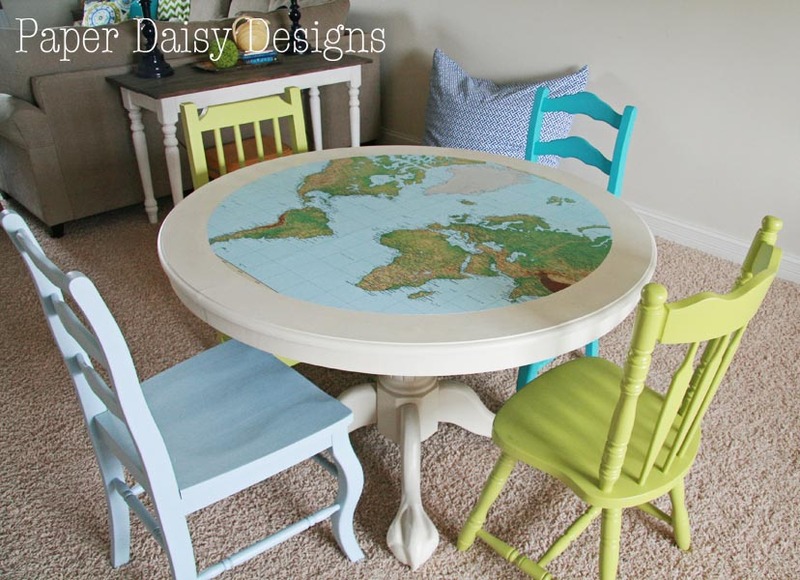 The coffee table…the map table- awesome! What an adorable room! I love how bright and cheerful it is. And I totally agree with what you said about scoring things on a bargain, I believe being on a budget boosts your creativity and makes you create unique things.<br /><br />And your dog is so cute! I am glad to finally see the finished room. Beautiful, just beautiful! What a delightful room! I love everything in it! I have girls – but they LOVE their legos! They build and build and create and create. I loved your idea of putting the people in the jar – I&#39;m pinning that! I hope I remember to do that when the legos are gathering dust instead of being played with! This room looks incredible! Perfect combination of color, comfort and coziness!! Can I come over??? I love every detail! Just the kind of room I want to spend time in. I&#39;ll be right over! Oh my! 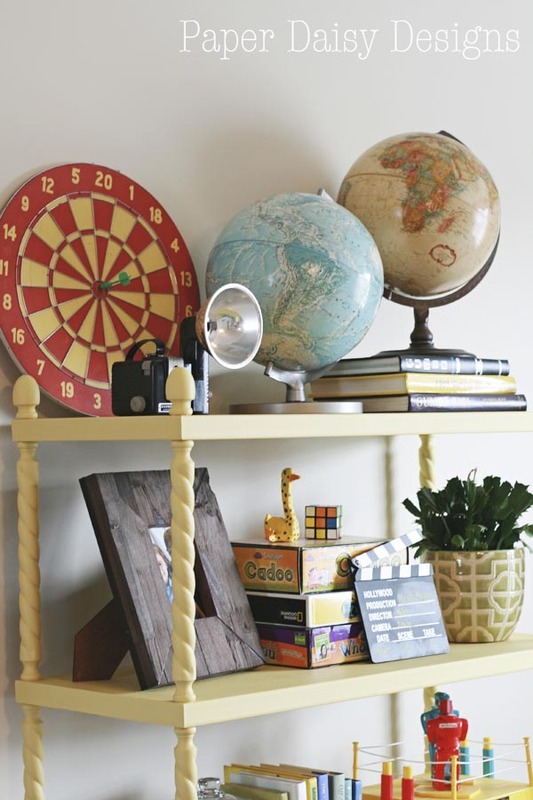 I just found your blog via an old I Spy Saturday on the Shabby Creek&#39;s blog and love this. I would take everything in this room for anywhere in my house, especially our TV room or our crazy, nasty, unfinished basement that I dream of turning into a man cave/family room. I&#39;m now off to check out your other posts and dream this is all in my house! Love this room! Do you mind sharing how you made the curtains? You mentioned that you did it different than most.